Argus home security solutions supply and install colorbond fencing in Canberra. Colorbond fencing is made from Australian Bluescope steel, it has been tested to last in Australias conditions. Fencing panels come in 2.4 metre lengths and a standard 1.5, 1.8 or 2.1 height. A range of extension can be added for looks, design or security, such as a lattice or slat design. Colorbond is Australia’s most trusted brand for boundary fencing for over 50 years. 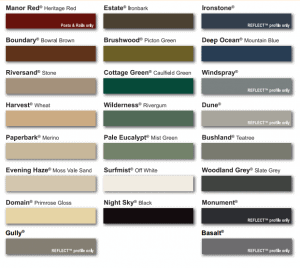 If you are after security, privacy or an aesthetic addition to your home, Colorbond will give you all of these with the guarantee it will look it’s best for years to come. Available in 23 designer colours, you are sure to find one to compliment the rest of your home. Bluescope steel is fireproof and termite resistant and comes with a 10 year warranty. 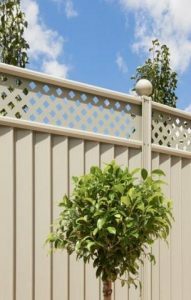 We supply and install genuine ColorMax Boundary fencing by Colorbond. Elegant, affordable and durable. Although many try to imitate colorbond, it remains unmatched in quality. Argus will measure and install your Colorbond fencing, and if required can remove and stack your old fence on site for removal. We also manufacture and install Aluminium slat fencing.